Note: Quote echoing a sentiment similar to this… "Land O'Lakes felt it was important to invest in and support the leaders of tomorrow. We have seen Golden Gopher Athletics continue to build out robust, inclusive programming for years that directly impacts and serves the broader Twin Cities community. We are excited to partner with such exceptional young men and women, and look forward to arming them with the resources and experiences necessary to take on the challenges of tomorrow". 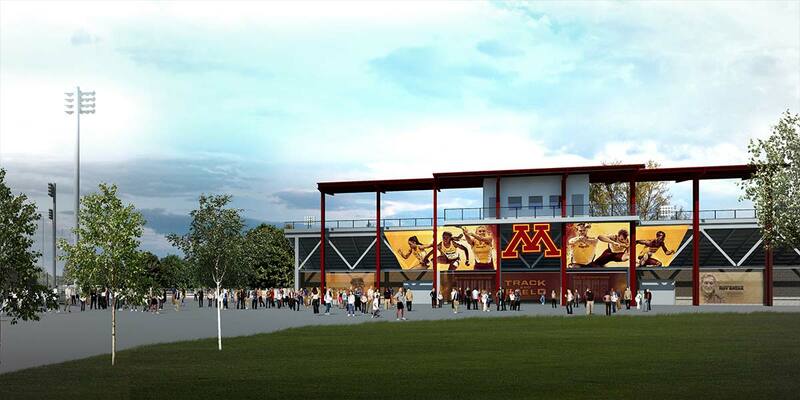 The new outdoor track and field stadium at the University of Minnesota will give the Golden Gopher programs their first opportunities in more than 15 years to host home meets, including Big Ten and NCAA competition. Located in the heart of the new Athletes Village area, this facility will become synonymous with track and field excellence in the Midwest. 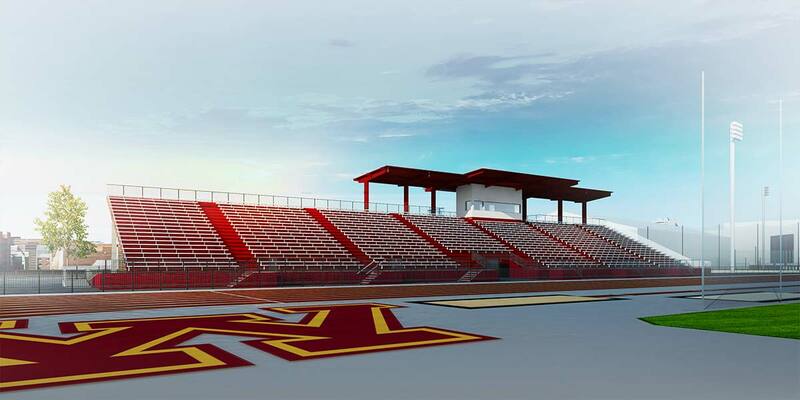 It will not only provide a first-class experience for the young men and women who compete for Minnesota, it will provide Minnesota high schools with a venue for state meets and USA Track and Field with a Minnesota option for placing its marquee events. A nine-lane track - A state-of-the-art surface set with nine lanes and three chutes, providing the flexibility to host major competitions at all levels. Full field event hosting capabilities - Amenities and space will be available to host all field events, as well as steeplechase, on-site. 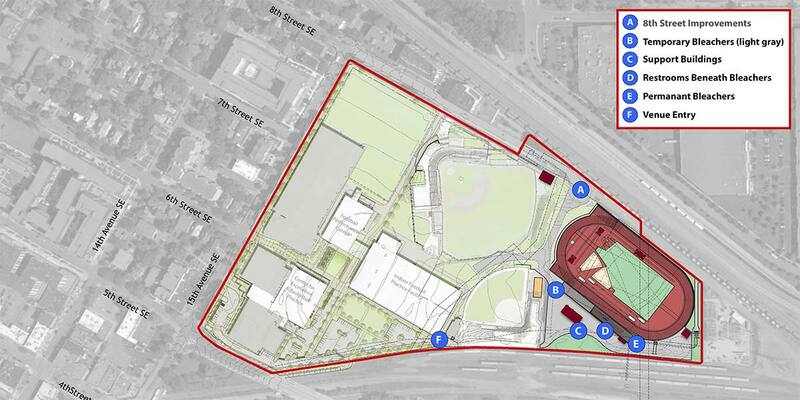 This facility will be capable of hosting all events for a complete track and field competition. 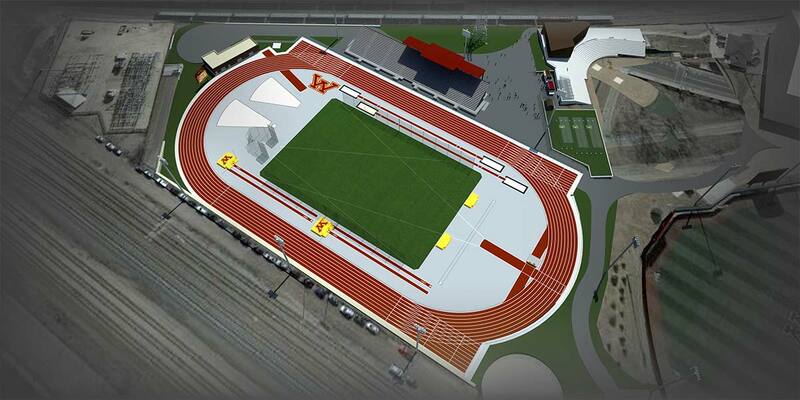 Versatile configuration - The facility's layout will provide opportunities to run sprints on both the front and backstretches, as well as opportunities to change directions for long jump, triple jump, pole vault and other events to work with the prevailing winds on competition days. Warm-up and cool down areas - Private spaces beneath the grandstands will provide competitors areas to warm up prior to competing and cool down following their events. Grandstands with capacity to host major competitions - A combination of permanent and event-based seating will create enough available seats to host many of the state's and nation's largest meets.